When car guys get together and talk cars, you can bet the subject will eventually turn to their favorite car chase movie. Many will say Smokey and the Bandit. Others will say Vanishing Point. Most will say the best car chase ever filmed was in the movie Bullitt. The chase in Bullitt features police lieutenant Frank Bullitt and his 1968 Ford Mustang GT 390 chasing a couple of shady mob hitmen through the streets of San Francisco. The nine minute, 42 second car chase ends after Bullitt forces the hitmen and their 1968 Dodge Charger off the road where they crash into a gas station, resulting in a fiery explosion. Warner Brothers used two 1968 Ford Mustang GTs during filming. The hero car, serial number #559, was used mainly for shooting light duty driving scenes. The other Mustang, serial number #558, was the stunt double. Expert racer and car builder Max Balchowski was brought on board to modify the Mustangs for high-speed driving. He installed stouter springs and shocks, and constructed braces for the cars’ inner fenders. He also did a little tweaking under the hood to give the 390 cubic-inch V8s some additional firepower. By the time filming had ended, both Mustangs were somewhat battered and bruised. #558 was supposedly sent to the crusher but was recently found rotting away in a salvage yard in Baja, Mexico. What was left of the body was bought by two collectors and is supposedly undergoing a full restoration. #559 was initially sold by Warner Brothers to Robert Ross. Ross actually worked for Warner Brothers in the film editorial department. Ross later sold the car in 1970 to police detective Frank Marranca. Marranca paid a whopping $6,000 for #559 and had it shipped by rail to his home in New Jersey. In April 1974, Marranca sold #559 through a classified ad placed in the October 1974 issue of Road and Track magazine. The advertisement caught the attention of Bob Kiernan who also purchased the car for $6,000. The car remained in Kiernan’s possession until his death in 2014. The car is now in the possession of Sean Kiernan, Bob’s son. Over the years, Steve McQueen made several attempts to purchase #559. In 1977, he called Frank Marranca to see if he was willing to sell the car. Sadly, McQueen was three years too late. However, Marranca did have the contact info for Bob Kiernan. McQueen made several attempts to buy #559 from Kiernan but he wouldn’t budge. 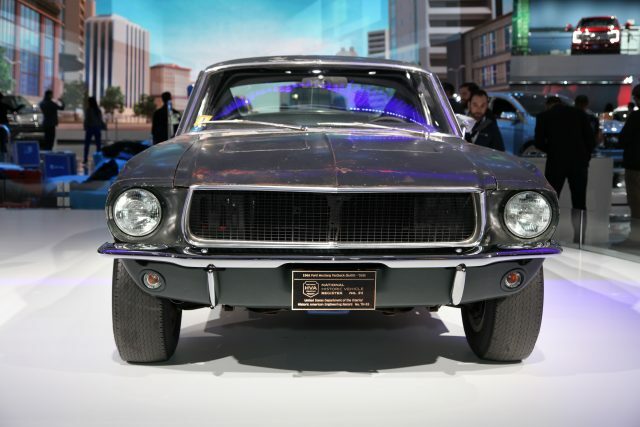 Unfortunately, McQueen’s dream of owning his Bullitt Mustang co-star was never realized. He died in 1980. Hidden away from public view for over four decades, #559 returned to center stage on January 14, 2018. #559 starred alongside the new 50th Anniversary Ford Mustang Bullitt during its unveiling at the North American International Auto Show in Detroit. It’s been speculated that Ford would create another Bullitt edition to coincide with the film’s 50th anniversary. However, no one really expected to see the actual hero car used in the movie share the limelight with its modern-day progeny. #559 was also acknowledged for its historical impact by the Historic Vehicle Association, U.S. Department of the Interior, Historic American Engineering Record, and the Library of Congress archives. After 50 years, this extraordinary piece of automotive history is finally receiving some long overdue accolades for its contributions to film, Americana, and overall car culture. Now that the car has come out of hiding, it’s speculated it will go on a national tour. It’s great to see that its current owner is willing to share this iconic treasure with the world. Not many movie cars are as iconic as the Bullitt Mustang and seeing it up close and personal is truly an amazing experience. Just think of all the stories it could tell!